Tag Archives for " Google Local Services "
Oh, in my truest Bob Dylan voice, the times they are a changing for local marketing and SEO. Local search is one of the last places left for Google to wring a little more ad spend out of small businesses. The local map listing today is pure gold for mobile searches for certain types of businesses and Google knows it so they are expanding their Local Service ads accordingly. 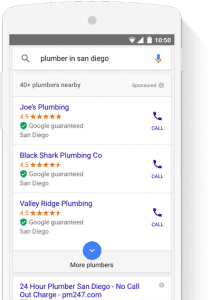 Google recently expanded their Local Services ads (formerly known as Home Services ads) to include 17 cities, with plans to expand to 30 cities by the end of 2017. With the expansion of these ads coming up fast, I thought now would be a good time to discuss exactly what they are so that you can consider them for your business or your client’s business moving forward. 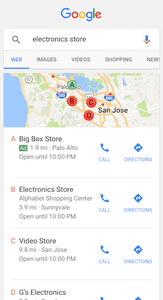 What are Google Local Services ads and how do they work? With Local Services, you have the ability to advertise your business on Google and receive leads directly from potential customers. 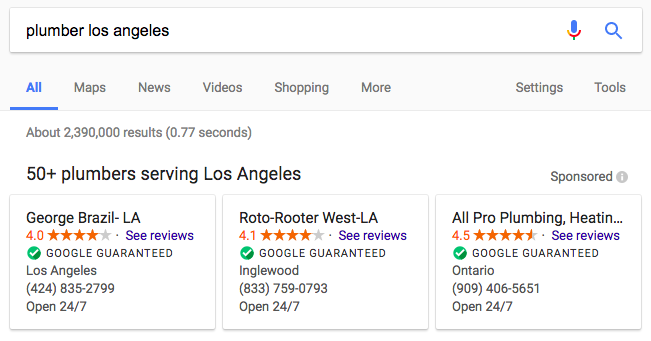 Local Services ads appear at the top of Google Search results (see above) when people search for the services in a given area. 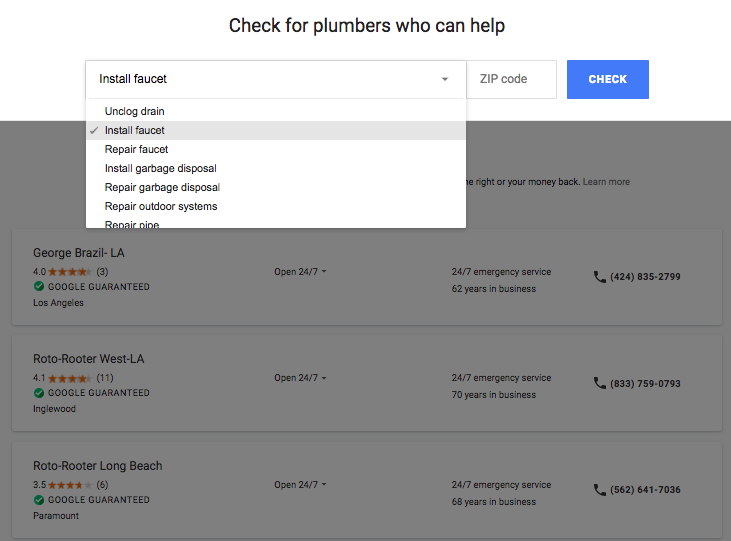 Once you click on “50+ plumbers serving Los Angeles,” you will be taken to a separate results page where you’ll see a list of all of the participating local services businesses. You’ll also see a drop-down menu of relevant services next to a zip code search box. 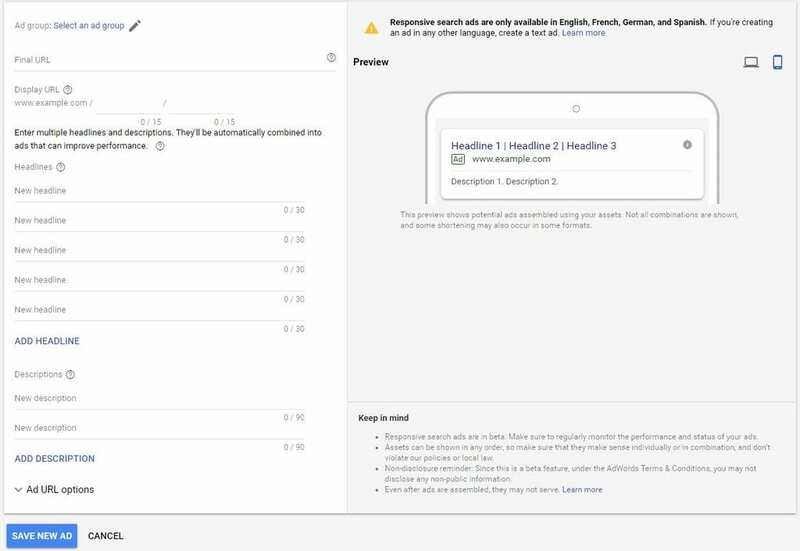 We’ll discuss later on how to optimize your chance of getting found in the first three spots on the first page of Google and not just in the list on the full list page. People have the choice to call a business or send a message by clicking on the ad. By using the Local Services app, businesses can reply to messages, manage leads, track bookings, manage campaigns and budget (it’s easy to turn your ads on and off depending when you want them), view an ad’s performance, and review ratings (ratings can come from Google My Business or through Local Services). Businesses can personalize their profile page and select the areas and predefined services where their ad will appear. To be clear, the ads you run are simply a way to get leads. It’s still your job to turn them into customers. Businesses that want to participate need to apply and go through a verification process (including meeting certain insurance and licensing requirements) and each employee must go through a background check, so be prepared that you likely won’t be able to get these ads up and running overnight. Once a business is screened and approved, they will receive a Google guarantee badge which builds trust and ensures Google will cover claims as high as the job invoice amount if a customer isn’t satisfied. The beauty of these ads is that you only pay for leads related to your business and the services you offer. The actual costs may vary depending on the type of lead, your location, and the type of job needed. You only pay if you receive a message or phone call through the platform. You also won’t waste time with spammy leads because if one of your leads isn’t legitimate, you can dispute it with Google (you may not always get your money back, but it’s worth a shot!). The other nice thing about this payment plan is that you’ll never exceed your monthly maximum budget. If for whatever reason you get leads that exceed your monthly budget, they will be credited back to you. Your cost is easy to manage. You can set a weekly budget based on the number of leads you want to receive, and you can always track your progress in the app by viewing your payment and charge history. Stay in good standing with Google. If they receive numerous complaints about your business, it will likely work against you. In addition, Google is a business after all, and they want to make money, so increasing your weekly Local Services ad budget isn’t the worst idea. Your proximity to potential customers’ locations may also impact your rank (Google wants to provide a good experience for the user, not just your business). Only time will tell what these ads will become, but if you fall into one of the categories and locations, I’d recommend testing them out.